The roadworks have created a contraflow on Lavender Hill outside Asda (I think this is in Battersea, but you may want to check with their store manager) so it might be best avoided for a while. The Clapham Junction scheme, overall, is intended to make the area better for pedestrians and traffic. Frankly Clapham Junction is a bit of a mess at the moment and sorely in need of improvement. The first phase will allow a right turn from Lavender Hill into Falcon Lane, relieving some of the congestion and the Lavender Hill/Falcon Road turn. If this goes to completion it should certainly do a lot of good for the public realm here, which is looking a bit tired. It’ll be interesting to see how this pans out – I remember it originally being quoted as costing around £7m over a number of years, which is probably unaffordable now; I hope the scheme hasn’t subsequently been value-engineered to the point where it merely replaces one set of cracked and uneven concrete block paving with another in a slightly different layout. Noticed some white lines the other day showing what are (I presume) the line of what will, one day, be widened pavements on the south side of the road (in front of Big Fat Panda) – do you know if there’s any pavement work in the first phase, or is it just reconfiguration of the traffic islands? The big London Plane tree, to the right of the photo above, was chopped down on Sunday. Not sure if it is related to this project, or just Asda trying to make their sign more prominent; it’s a pity and it’s not helped the look of this mildly scruffy stretch of Lavender Hill. It is an expensive scheme and, yes, in the current climate that is a problem. The council is planning on phasing it over a longer period (years, rather than months) to spread the cost, but like so much else the long term effects of the Comprehensive Spending Review later this month will give a better idea. 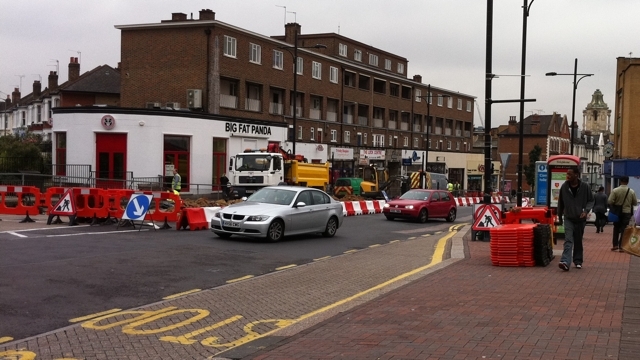 The main work in this phase is the road rather than the pavements, so the right turn into Falcon Lane will be created. The main change for pedestrians will be the crossing changing from a staggered to a straight crossing. And the tree was on Asda’s land. I think there were originally three trees on that land. The current paving has a line of bricks, running roughly in line with the front of the Post Office building, that marks the boundary between public and private land. Many years ago I tried to get one of the trees replaced, as there was just a bare tree pit, but Asda weren’t interested. Although some years later they did pave over the pit, you can see a slightly different patch where it was.